Vientiane (VNA) – President of the Vietnam Fatherland Front (VFF) Central Committee Tran Thanh Man and Chairman of the Lao Front for National Construction (LFNC) Saysomphone Phomvihane discussed strengthening bilateral ties during a reception in Vientiane on August 10. 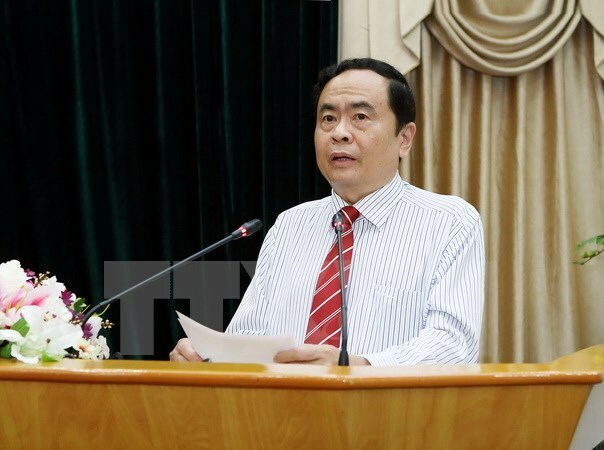 Man, who is in a working visit to Laos from August 10-13, expressed his delight at visiting Laos on the occasion of the 55th anniversary of the bilateral diplomatic ties and the 40th anniversary of the signing of Vietnam-Laos Treaty of Amity and Cooperation. He asked the two fronts to jointly launch a plan on implementing a Memorandum of Understanding (MoU) on Cooperation Programme among Vietnamese, Lao and Cambodian fronts and a joint communiqué between VFF and LFNC Central Committees about the outcomes of the international conference on building Vietnam-Laos borderline of peace, friendship, comprehensive cooperation for mutual development for 2017-2020. Man urged the host to suggest the Lao Party and State make it easier for Vietnamese nationals to acquire Lao citizenship, simplify procedures regarding marriage, business and labour. The Vietnamese official hoped that the two countries would step up transport connectivity, enhance infrastructure investment in border areas, and actively partner in the search and repatriation of remains of Vietnamese voluntary soldiers and experts who sacrificed their lives in Laos during the war. Phomvihane, for his part, thanked the Vietnamese Party, State, Front and people for their valuable and timely support for Laos during the war as well as the current construction and development.